Rev. Heng Sure is the Vice-President for Religious Affairs and Dean of Translation and Language Studies at Dharma Realm Buddhist University. He was ordained as a Buddhist monk in 1976. Rev. Heng Sure received his Master’s degree in Oriental languages from the University of California at Berkeley and his doctorate from the Graduate Theological Union. 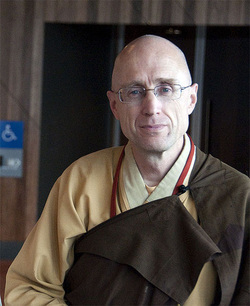 He serves as the Managing Director of the Berkeley Buddhist Monastery. In Jan 2012-April 2012, Jan 2013-April 2013,Jan 2014-April 2014 he taught a course on Buddhist Philosophy at Bond University during the Summer Semester. During this period, he resided and lectured on Dharma at Gold Coast Dharma Realm and other locations in Australia. He lectures on the Avatamsaka Sutra at the Berkeley Buddhist Monastery every Saturday evening. He is actively involved in interfaith dialogue and in the ongoing conversation between spirituality and technology. For the sake of world peace, he undertook an over six hundred mile pilgrimage from South Pasadena to Ukiah, repeatedly taking three steps and one bow to cover the entire journey. In the entire two years taken to make the pilgrimage, he observed a practice of total silence.